When I tried Windows 8 after beta installation for the first time, the one feature that I really liked was the charms bar on the right area of your screen, especially, on Search and “Shut Down” easy access. However, when I do my computing tasks on my laptop, that search charm bar is quite annoying, because every time I hover my cursor on that hot corner area, it pops up, even though I don’t want to open it. If you have this same problem like I do, you can disable Charms bar or enable it , depends on your preference. 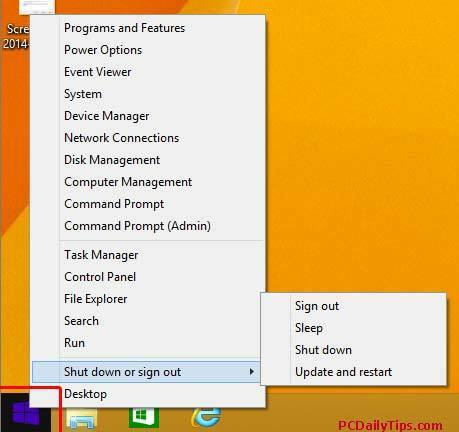 Read this if you want also to disable your start screen and login without entering your password whenever you use your Windows 8 PC. This is the Charms bar that we will disable. 1. 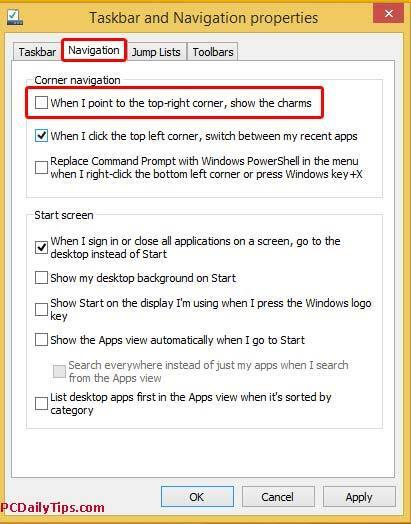 Anywhere in your Taskbar area (bottom of your desktop), right click it. 3. “Taskbar and Navigation properties” dialog box is open. 4. Go to “Navigation” tab. 6. Click “Apply” and “OK” buttons. This way, when you hover on the top right corner area of your desktop, you won’t see the Charms. And if for some reasons, you want to see them again, you need to repeat the steps above, and check the option. However, these are things I miss when I disabled this Charm bar, the “Shut Down” or power button and the “Search” features. 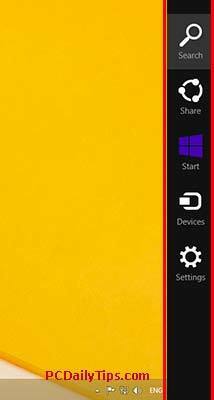 If you miss them too, you can use the “Windows” start icon easily. Right click Windows Start icon, and you can select “Shut down or sign out” option or “Search”, this will work just exactly the same as the Charms do.